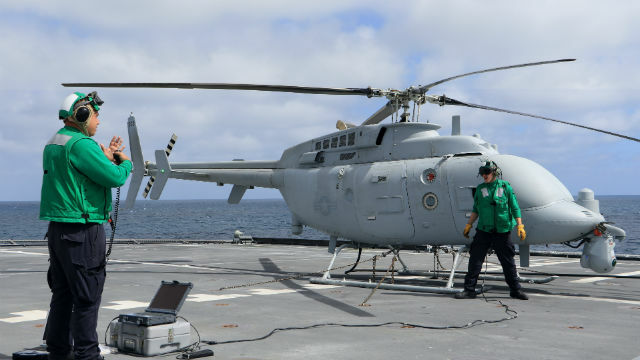 The San Diego-based USS Coronado has completed operational testing of an advanced unmanned helicopter designed for target identification, intelligence gathering and surface warfare. The MQ-8C Fire Scout was tested in several mission scenarios aboard the Coronado off the coast of southern California. The “Initial Operational Test and Evaluation” is an important milestone for both the Navy’s littoral combat ship program and the Northrop Grumman-built Fire Scout. “The results, lessons learned, and recommendations reported on following this underway test period are absolutely invaluable to the future of the MQ-8C Fire Scout,” said Lt. Cmdr. Seth Ervin, who led the testing team aboard the Coronado. The testing included simultaneously operating both the Fire Scout and a manned MH-60S Seahawk helicopter from the ship’s flight deck. Pierside testing of the MQ-8C Fire Scout will continue on board the Coronado through mid July.